Danny Lewis scores a layup during the first half at Alter. Lewis led Northmont with 23 points including a game-winning 3-point field goal to secure the Thunderbolts 700th all-time victory. Corey Gay scores during the second quarter to cut Alter’s lead to 20-17. Patrick Ivory scores inside and draws a foul from Alter’s Jack Smith. Ivory sank the bonus shot to give Northmont a 52-51 lead entering the fourth quarter. Ifeanyi Nwanoro scores inside past Alter defender Connor Meyer. 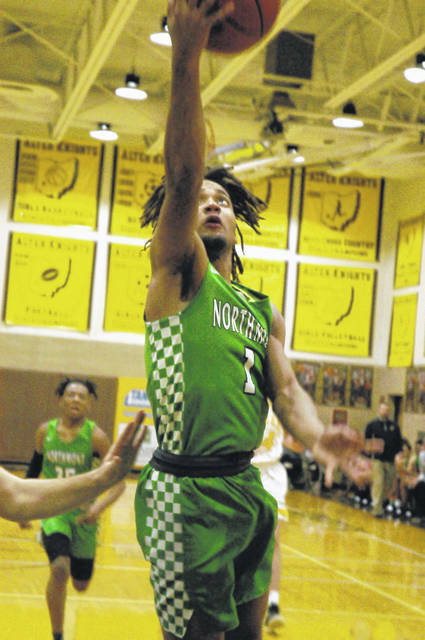 KETTERING — Danny Lewis hit a 3-point shot with 28 seconds left Tuesday night and Northmont prevented Alter from scoring a game tying basket on the final possession of the game as the Thunderbolts recorded their 700th all-time victory. Alter coaching legend, Joe Petrocelli, ‘The Godfather’ of Alter basketball, was in attendance to witness the contest in the gymnasium named in his honor at Archbishop Alter High School. Petrocelli, who became Alter’s first head basketball coach in 1964 at age 26, coached the Knights for 50 seasons in a storied career that included three state titles, one state runner-up, eight regional championships and 24 district titles and 831 career victories, second most all-time in state history. He retired in 2013 at age 75 when he led Alter to a 16-4 overall and 8-2 record in the Greater Catholic League North Division to win his fifth outright title and ninth overall. It was fitting for “Petro” to be present to witness Northmont’s milestone victory achieved over the school’s 60 year history. From the outset the game was hotly contested. Alter used a zone defense to slow down Northmont’s attack, but the Thunderbolts adjusted well and displayed patience on most possessions. Alter was able to find players open along the baseline throughout the game for easy layups or bank shots, but after Lewis buried the 3-pointer to put Northmont on top the defense answered the call. The Thunderbolts swatted the ball out of bounds on Alter’s final possession and clogged the inside. 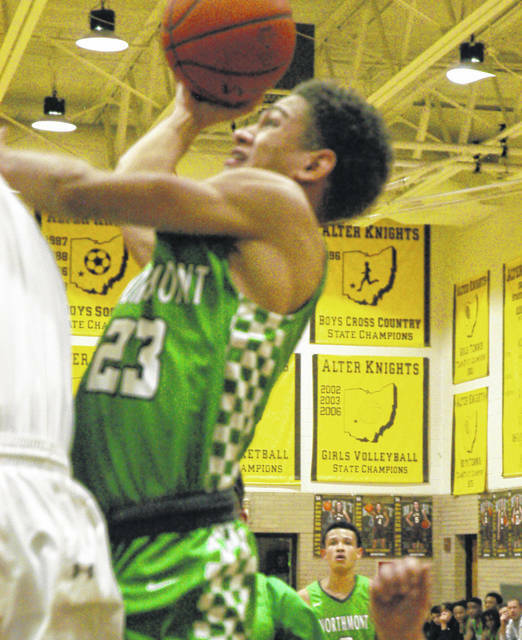 The Knights put up a shot that missed, snared the rebound and fired another shot inside under heavy pressure that failed to fall as the Thunderbolts walked away with a hard-fought win to snap a nine game losing streak. 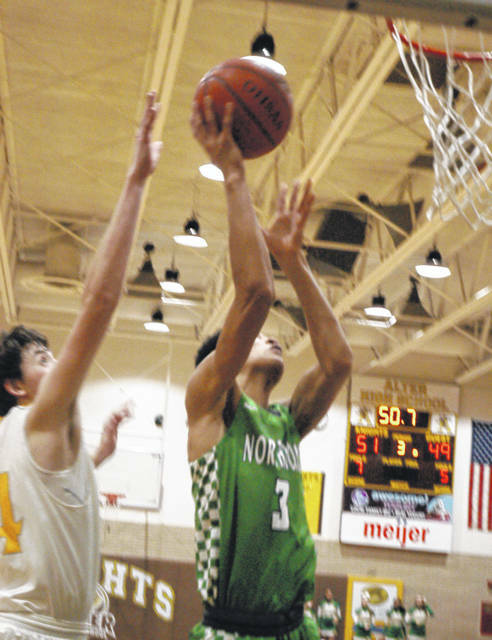 The young Northmont team has taken its lumps this season but has been a very competitive team, the kind that can do a lot of damage in postseason play by catching heavily favored opponents off guard. Alter’s ability to score along the baseline was a weakness the Thunderbolts were able to overcome when it counted. Prophet Johnson came up with three steals late in the game, two of which resulted in player control fouls against Lewis and Di’talian Rayford. Rayford also came up with a steal and got slapped with a player control foul as he tried to dish the ball off inside the paint. Trailing 65-64 Lewis came through with a trey to propel the Thunderbolts to victory. 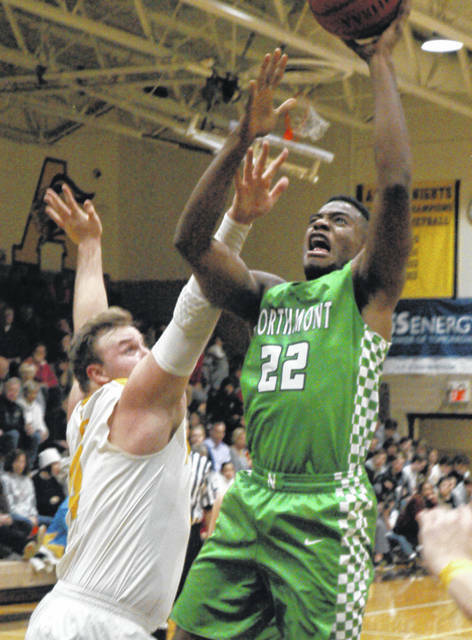 Lewis led Northmont with 23 points while Patrick Ivory tossed in 11 to top the scoring attack. Jack Smith led Alter with 20 points including four 3-point field goals. Conor Stolly had 12 and Brady Uhl tossed in 11 for the Knights. The Thunderbolts have the rest of the week off. Northmont hosts Lebanon on Tuesday, Feb. 5, plays at Springboro on Friday, Feb. 8 and at Bellefontaine on Saturday, Feb. 9. All three games start at 7:30 p.m.
Northmont: Danny Lewis 7-6-23, Di’talian Rayford 1-3-5, Patrick Ivory 5-1-11, Justin Golson 3-0-6, Isaiah Baldwin 0-2-2, Jordan Smith 2-1-5, Ifeanyi Nwanoro 2-1-5, Corey Gay 3-0-7, Prophet Johnson 1-1-3. Totals: 24-15-67. Alter: Dominic Ruffolo 2-0-4, Connor Meyer 3-1-7, Stephen Harker 2-1-5, Jack Smith 7-2-20, Rich Kolb 0-1-1, Connor Bazelak 2-0-5, Conor Stolly 5-2-12, Brady Uhl 4-1-11. Totals: 25-8-65. 3-point goals: Northmont 4 (Lewis 3, Gay); Alter 7 (Smith 4, Uhl 2, Bazelak). Records: Northmont 5-11, Alter 8-9.